George K is an accomplished guitarist having played with high profile and accomplished acts in Adelaide and the eastern states. Some of these acts include; ‘Reggae On’, The Dwight Adams Band, Ross Wilson,’ Pop Fiction’ ‘The Ultimate Robbie Williams Experience’ and “The Gospel According to Elvis” national tour. George is a highly sought after session musician specialising in a number of musical genres ranging from soul, jazz, and rock to reggae and also country. He has also toured Australia and Asia, and his guitar lines are prevalent on a number of outstanding recordings. 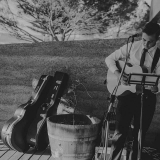 With George K Acoustic, George will be presenting a range of some great tunes which he will be singing and accompanying himself on acoustic guitar ideal for everything from pop tunes to his great love of country and bluegrass classics.